Our project days are a great way to develop your own ideas in glass (or other art forms) before investing in tools and creating a working space of your own. If you've done some stained glass or fusing before and you'd like to gain more experience, work on your own designs, or just want to be creative in a supportive environment, our project days scheme is for you! We invite you to rent a space in our studio, use our tools and materials (although you can always bring your own) and get making! For just £50 per day you'll have access to a workbench and some storage space, our stained glass or glass fusing tools, lightbox, layout boards and all the facilities we use ourselves. We'll even include a single firing in our kiln for glass fusers. If you'd prefer to use our materials (glass, lead, solder, fusible glass, etc) we're happy to supply, charged at cost plus 5%. We'll keep a tally of what you use, and at the end of the day (or days) show you on our suppliers' websites what those materials cost; we pro-rata sheets of glass to the nearest half-sheet so you won't pay for what you haven't used! If you'd like to bring your own materials (and we can advise where to get these from) then just bring them along and we'll make sure they're kept separate from our own. Where a project is likely to take more than one day that's fine - we'll agree some extra dates to get your project finished - take as long as you need. 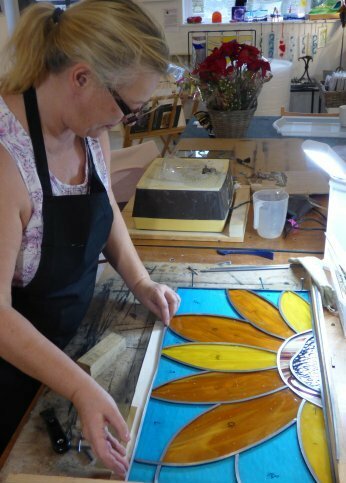 These project sessions are suitable for artists with some experience in the chosen artform; if you're a beginner we suggest you start with one of our fully tutored classes in stained glass or glass fusing. Of course, there'll always be one of us on hand to offer advice, encouragement and handy tips but it's important to note our project days are supported, but not tutored. We're always happy to contribute specialist expertise when needed - we want your project to be the best it can be! 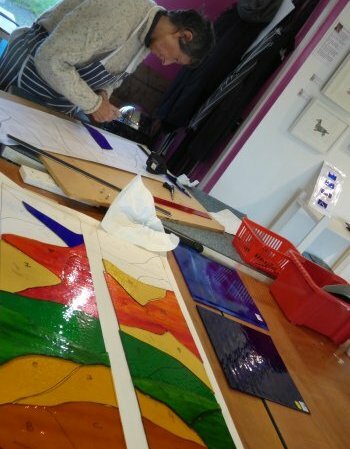 Students have created large stained glass windows for their homes, fused glass panels, glass jewellery, garden glass panels, textile sculptures, glass art for indoors and much more on project days here at Wakefield Country Courtyard. Use our tools and facilities, ask for advice if you need it, enjoy being creative! Tea, coffee, biscuits (and frequently cakes) are all included, and you're welcome to to bring your lunch and keep it in our fridge. Please contact us in the gallery (01327 810320) or jenny@vitreusart.co.uk to agree dates and to discuss your design. If particular materials are required we'll discuss ordering these too. 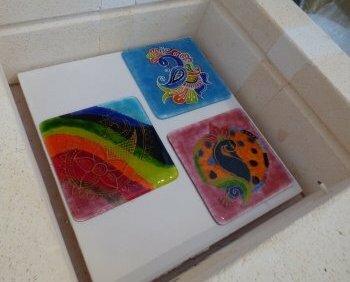 If kiln firings are required we'll work out in advance when the kiln will be ready to accept your masterpieces! 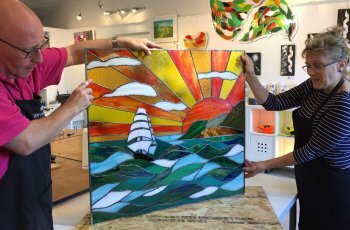 Vitreus Art is Jenny Timms and Mike Caddy - glass artists, course providers, and proprietors of Vitreus Art @ Wakefield. Jenny is an accomplished glass artist who loves to share her passion for all glass art forms with students and visitors to the gallery. Latterly Jenny has added glass applique, glass fusing and candle-making to her range of talents! Mike has developed a specialism in traditional leaded stained glass and the creation of 3d glass work. Together, the pair pride themselves on their friendly and supportive teaching style and in running inspiring courses for all levels.